Spinner dolphin. Photo courtesy of Ann Zoidis. This dolphin gets its names because of its unique behavior of rapidly spinning in air. 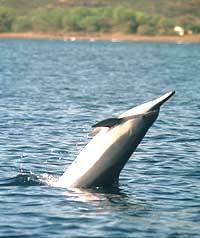 The spinner dolphin is the most common small dolphin in the warm waters of the tropics. 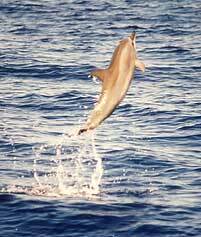 Spinner dolphins can inhabit in-shore waters and waters around islands, although most spinner dolphin populations inhabit the open ocean, such as the tropical Pacific Ocean. These animals are easily spotted from great distances because they tend to perform great aerial displays of leaps, flips, and spins. Spinner dolphins appear to be striped, for they have a dark stripe in the very top of their body, a lighter gray stripe on their sides, and a white underside. They also have an elongated, very dark gray rostrum that makes them easy to recognize. Adult males and females range in length from 1.3 to 2.3 m (4.3-7.5 ft) and weigh 55-75 kg (120-165 lbs).Spinner dolphins produce whistles, burst pulses, and echolocation clicks. In a study around Hawaii, spinner dolphin whistles lasted between 0.05 and 1.28 seconds, with fundamental frequencies between 2 and 22 kHz. Burst pulses can be produced alone, in bouts, or associated with whistles. Around Hawaii, burst pulses had approximately 30 clicks per trains with an average peak frequency of 32.3 kHz. The echolocation clicks of spinner dolphins can range up to 65 kHz. Spinner dolphin. Photos courtesy of Ann Zoidis.